Here’s some great news. If you can’t commit to a CELTA course in a physical location for whatever reason, there is now another option. Some CELTA centres are offering the content of the original CELTA course adapted for online study. The online version of the CELTA offers more flexibility and convenience, ideal for people with family obligations, work commitments or busy schedules. 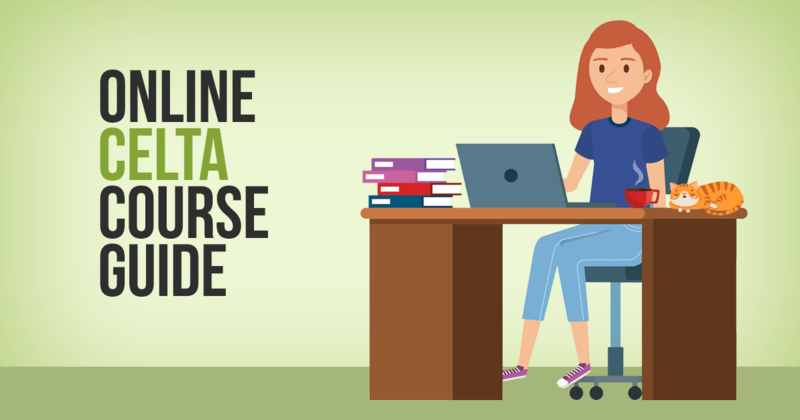 I’ve put this guide together to give you a detailed overview of the online CELTA course and to answer any questions or concerns you might have. Although sometimes described as ‘online’ courses, the CELTA courses are not 100% online. A better description is blended learning, meaning that the bulk of the course is completed over the internet but it also includes some teaching practice that takes place in a physical location. Despite the online CELTA course offering some off-site elements, you won’t be able to entirely escape visiting a CELTA centre for your teaching practice and lesson observations. The teaching practice element of the course will take place at a training centre on specific dates and times. You’ll get plenty of notice so you can plan your calendar. There will be a CELTA certified tutor on hand for support and you will be able to work collaboratively with other students. This is a great opportunity to share and improve your performance, so you should make the most of your onsite sessions. The training provider will typically offer the theory and lecture sections through an online portal, where you can work through course materials that include videos, documents and interactive activities to work through. You’ll also get the chance to collaborate and discuss course materials with other trainees in forums or virtual learning environments. You’ll be assigned an CELTA tutor that you can connect with through the forum or by other means; they will assist you with completing the online study and provide guidance and support. The online CELTA course includes 120 hours of online study. This includes tutor input sessions, activities, teaching practice, evaluations, lesson observations and one-to-one feedback sessions with your tutor. However, just like the traditional CELTA course, you’ll also need to dedicate significant extra time (I estimate around 80 hours) to self-directed study and revision, planning lessons and completing written assignments. Which parts are offline (at the CELTA centre)? Teaching Practice – This takes place during designated times (some centres spread it out over a number of evenings for convenience). You will normally be placed in a group, where each trainee spends six hours teaching. When you are not teaching, you’ll be expected to observe and report on other trainees’ lessons too. Lesson Observations – You will observe some qualified teachers as they teach a real class. You’ll then be asked to write a report on what you’ve learned: their techniques and classroom management. This is a wonderful opportunity to pick up some tips from professional teachers. Supported Lesson Planning – Supervised by your course tutor, you’ll complete lesson planning sessions in groups. Here you’ll learn effective methods for lesson planning and get feedback on your plans.These practical sections take place at a training centre and involve 6 hours of assessed teaching practice and at least 8 opportunities to teach and receive feedback and evaluation. Is the Online CELTA right for me? You should be aged 18 or over. You should be educated to a standard that would be eligible for entry into higher education. If English isn’t your first language, you will need to prove your skills to an equivalent to C1 or C2 on the Common European Framework of Reference (CEFR). You do not need a university degree in order to apply for the CELTA. There are some great benefits to studying the online CELTA, rather than the entirely classroom-based option. As you can take the online units at home and some can be done at any time of day or night, the online version offers a great deal of flexibility. It’s ideal for people with other professional or personal commitments, allowing you to fit studying around your schedule. Other advantages include not having to travel to a training centre so often and — if cost is a consideration — you’ll save money on travel and accommodation expenses. If you’re short on time or on a tight budget, then the online CELTA may be an option worth considering. Is the online CELTA recognised the same as the traditional CELTA by employers? The online CELTA should carry the same status as the conventional one. It is assessed and moderated according to the same criteria as the standard CELTA qualification. The certificate you receive will make no mention of the fact that the course was taught partly online, as it is exactly the same qualification. The course is still assessed locally by approved assessors, so the outcomes are the same for all trainees, regardless of whether part of the training was online or not. The online CELTA is a flexible course that can be studied part-time or full-time. It will take a minimum of 10 weeks up to a maximum of one academic year to complete. Dates vary depending on training centre. You can find CELTA centres that support the online study option here on the Cambridge website. Be sure to select ‘CELTA Course Online’ from the dropdown menu! How much does the online CELTA cost? The cost varies from centre to centre, but on average expect to pay around £1,500 (approx. $2,000 US or 1,650 Euros) for the entire course, including online elements and on-site training. They are priced roughly the same as on-site CELTA courses, but don’t forget that you will save money on transport and accommodation costs by not having to attend the training centre so often. Some course providers may offer payment plans to spread the cost of the course. How is the online CELTA course assessed? Many more skills that are demonstrated throughout the course. Like the full-time and part-time study options, there are no exams. You will be assessed constantly by your CELTA tutor throughout the course. There are 3 pass grades: A, B and Pass. For certain tasks you will be expected to take part in virtual real-time classrooms to work collaboratively. This means being connected online at a specified time. Other learning modules can be taken independently, at a convenient time for you. Remember that submission deadlines for lesson plans, evaluations and written assignments will still apply, so don’t leave them to the last minute if your internet connection is spotty. Is the online CELTA eligible for any funding? It may be worth contacting the school you plan to work at to ask if they can provide funding, especially if you have close links with them. I think this is quite rare though, so don’t waste too much time contacting lots of different schools. Some countries have non-government organisations and charities that focus on promoting education, teaching or language (e.g. the British Council in the UK) and may be allocated with government funds to share. If you’re not eligible for or can’t find a funding grant, your government may offer a scheme for reduced-rate career loans. In the UK these are called Career Development Loans. Between £300 and £10,000 can be borrowed at a reduced rate of interest. Please consider the fact that you will have to repay this loan whether you complete the course or not. Will the word ‘online’ appear on my certificate? No, not according to Cambridge English. The qualification you receive is exactly the same as the traditional face-to-face CELTA. 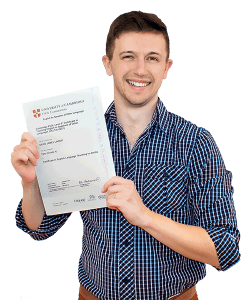 Cambridge English have clearly stated that there is no need for a separate certificate, so it will be identical to the certificate you’d receive if you passed the standard CELTA, with no mention of the online component. Check the CELTA centre directory and the Cambridge English website to find the best location. Check the website of your chosen CELTA centre, drop them an email, or give them a call. Oooh, I have a great CELTA interview guide to help you here too! Most interviews can be done on the phone or Skype. Be sure to ask any questions too. This is a great way to get your brain ready for learning and teaching. Just do your best. Subscribe to my newsletter for tips and advice to prepare for your CELTA course. At this point you’ve been accepted and it’s time to earn your certificate. Good luck! Graduate as a new English teacher! You did it! You’re now a fully qualified English language teacher and can start your new career. The online CELTA has some definite advantages. If you need flexibility, you’re a long distance from a training centre or you just prefer to save some time by studying from home, then the online version may be right for you. If none of these apply, then the standard course is probably a better option, especially if you prefer the structure of set study times at a training centre. Hi, English is not my first languag. So i do i prove my skills to an equivalent to C1 or C2 on the Common European Framework of Reference (CEFR)? You can show your English skills either with a certificate such as the FCE, CAE, or IELTS score, or you can simply demonstrate your fluency face-to-face during your intial interview with your CELTA course. My advice is to ask your CELTA centre what method they require, as each centre is different. Good luck!